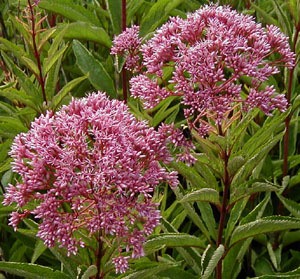 Joy Creek Photo Archive (c) all rights reserved This tall, stately, herbaceous perennial not only attracts human visitors to the garden but Eupatorium maculatum 'Atropurpureum' also draws butterflies and bees which feed on its large, flattened, purple flower heads. The lance-shaped leaves are tinged with purple and there is purple speckling on the flower stems. Use this as a focal point in the border garden. Midsummer to early fall. Up to 7 ft. x 3 ft.